Yesterday it hit a record high 106 here in Austin. I thought it was strange when I was on I-35 about 5 pm and looked down and saw the outside temp reading was 117 degrees! Yikes. They definitely need SOLAR security film here...LOL. Got to go to a trade show.. Temperatures are running over 100 degrees in Texas - it was 104 yesterday in Houston. This is heat the kills, and costs a bundle to air condition. We've been doing a number of installations of security film with solar control - which gives hurricane protection but also cuts 70% of the solar heat coming through your windows. That means you have 70% less hot air that air conditioner has to cool. and that means a huge savings in energy costs. We are in the dog days of summer and its only four days since summer started! Imagine what it will feel like in August, our really "hot" month! I still encounter people who think that we've had our hurricane for the next decade. They seem to forget that since 2005 we have had close calls from Katrina, Rita, Humberto, Dolly, Gustav -- and a hit from IKE. That's 5 hurricanes hitting Texas in the last four years. The percentage of hurricanes that hit Texas are 40% of the total, according to the Texas Hurricane Center at the University of Houston. That means we could be hit by nearly one half of the hurricanes that form this year! If you don't have security film on your windows on your windows or more expensive shutters you are not prepared to Shelter in Place. Yesterday a man in Seabrook have told me that the outside panels they had installed (at great cost) simply blew off during IKE! A City Manager told me that they had windows break behind shutters (probably from the wind pressure). NEW news on Iran - now the regime itself says that the number of people voting in over 50 cities in Iran was actually more than the total number of registered voters in those cities! The Ayatollahs should have required science and math to go along with "religion only" courses! If this is not evidence of massive vote fraud, what is? At the minimum a new election should be called. But instead the Ayatollahs said the over-voting "only happened in 50 cities" and seem ready to use force to cling to power. All we can do as Americans is wish them success so the Ayatollahs cannot use it against us, and lie and claim it is Americans causing the changes in Iran. It is the majority Iranian people tired of the hardliners that is changing in Iran. If the Iranian people keep up the heat by going on strike and going into the streets, like they did in 1979, they could succeed. We can pray they do. Only then will Americans be able to help, by engaging the new leadership in business and dialogue. It's evident that talking to the hardliners won't bring any changes - if they aren't listening to their own majority by would they listen to anyone else? But its amazing that they now admit the vote totals don't add up --not when more they exceed the number of registered voters. They have trapped themselves in a fraud that is now exposed. Now what will they do in their desperate hour to hold power? A recent commenter claimed Iran's election to be fair. To me, he came across as an apologist for the hardliners in Iran. Counting 48 million paper ballots doesn’t happen in 2 hours. Bringing out the police to make your point is not the actions of a winner. If the elections were fair, then why does the government feel the need to beat people for assembling to simply protest? We do that in America and Europe, even Israel, all the time. Why do the bearded old men feel so threatened that their forces shot a young woman named NEDA, a bystander who died in front of the world on a cell phone video that Iranians themselves shot because the fraudulent winners of the alleged election shut down all media? We have seen why they don't want us to see those images in Iran, only seen by the world because of Twitter. When the pseudo-religious dictators shut down all TV and keep out foreign news media, how does that say free and fair? These actions do not define a democracy. They show the world the truth of a religious dictatorship run amok. The mask has fallen off. We now see the narrow-minded mindset of religious extremists who panicked when they realized they were losing control and felt they had to steal it away from the peoples' choice, so the "election" would only be the choice of a few extremist Ayatollahs. President Obama has played it smart. If he had done what many have demanded, it would have appeared that this was American-directed instead of the Iranian peoples' revolution it has been. That would have allowed the hardliners to kill their people by claiming an outside force behind it, and crush. 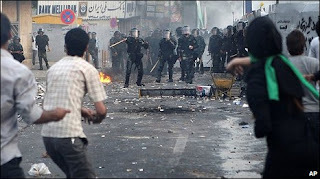 They would have lied when in fact it a huge desire for CHANGE coming from a majority of Iranians inside Iran. It includes young Iranians who are tired of grumpy old extremists telling them how to run their lives in the global Internet age. Only the Internet age has made it possible for the first time in human history for the majority of people to show the world what is really happening despite the government pulling the plug on communications. Imagine how it would be for Chinese to be sending Tweets and photos from Tiananmen Square in 1989 when the tanks rolled in. This is a true revolution from inside Iran. It remains to be seen how it will play out. But it is the most dramatic, unforeseen development in the Middle East in over 30 years -- by a oil-rich, borderline nuclear power. It comes at a critical moment in its development. This is a war between the hardline conservatives and the reformists and centrists. It is not unlike what happened in our last election. Our security and the world’s security won't be helped if the President followed the advice of Mr. McCain and gave the Ayatollahs a gift, claiming it is an American-led change instead of a struggle for Iran’s soul by its own people that it is - Iran's people feel cheated out of their vote in an honest election. THAT is what is driving their gatherings in the streets. What else but anger at injustice and unfairness could bring people out in such masses? The Ayatollahs blew it – they never wanted “democracy” if it really followed the people’s will instead of their own. If the people of Iran strike, the oil revenues of the Ayatollahs could up the ante. It could lead to an amazing change in the direction of Iran at a critical time. If the Ayatollah’s turn guns on their own people, they risk showing themselves as anything but religious. On top of the chaos in Iran, there are two other serious issues we need to pay attention to. One is the threat by North Korea to shoot a few missiles towards Hawaii "as a test." That means it’s time we took some action. U.S. ships are now shadowing a North Korean ship that left Korea and is believed to be carrying nuclear-related technology. It’s known that North Korea has been selling nuke technology on the global black market. The UN has authority to inspect that ship. We should start using that authority now that Korea has gone over the line on its threats. Conducting missile tests is one thing. Threatening to shoot them towards U.S. territory is a game changer. We don’t need these guys selling nukes to Al Qaida’s allies, so let’s start inspecting every suspect Korean ship. The Pentagon has moved a mobile anti-missile battery to Hawaii, so we may get to see if all that Star Wars technology really works or not. Speaking of Al Qaida, they are already setting up a new base since they are about to be squeezed from Pakistan and Afghanistan between UN and Pakistani forces. Yesterday Islamist forces sent a suicide bomber and assassinated Somalia’s Security Minister, strengthening their hand. Look at a map of the world. You can easily get from Pakistan and Afghanistan to Somalia if you are Al Qaida maniacs. We need to become engaged, with the UN, in Somalia before it becomes the next terrorist base to launch an attack on the U.S., Europe, etc. And the Ayatollahs in Iran seem bent on turning a democracy into a religious dictatorship in order to keep their death grip on power. The fact that they are arresting opposition leaders and censoring all news coming out of Iran confirms that something is really wrong. Their refusal to let an international body investigate the election returns is evidence that they don’t want the truth or an open, fair election. All of this threatens our security on top of the threats from mother nature in the form of tornadoes, hurricanes and earthquakes. We MUST prepare for all of these or risk greater injury or death in the future. It's ACTION time...Act before it is too late. It's been HOT - over 97 degrees without a break in sight. Climate change is not a theory. It is HERE. That means future Hurricanes/tornadoes, etc. are going to be stronger and more destructive. The EMS people have a one word speech: Preparedness. Are you prepared? Some people are buying generators that hook up to their gas line. They are much quieter than the gasoline models and you don't have to find gasoline for them. After IKE, the natural gas lines still worked but the gasoline stations were shut down, either out of fuel or because they lacked generators to run the pumps. Windows remain the biggest weakness on every building. Most of these are still vulnerable. Get them covered with security protection now because when the first storms start up in the next few weeks, it will be too late. Before I was providing security technology I was a TV terrorism analyst on and after 9/11. I have to say what is happening in Iran is HUGE - it is the first time in over 30 years that reformers in Iran have a shot at breaking the grip of religious extremists. And it was made possible by the most unlikely of heroes, a program called Twitter. What is happening in Iran is also strangely similar to what happened in the U.S. in November 2008--the battle between the forces of reform and those of the conservative status quo that had been in power. Iran's economy is in a shambles after four years of mismanagement, as was the U.S. economy. Iranians are tired of the religious police who are always harassing women for showing their hair and couples who just want to walk and talk together much less hold hands. One commenter to the last blog said that he thought two hours was plenty of time for the Iranians to count millions of PAPER ballots. Then he blamed the outcome on the Bush administration. I was no fan of the Bush era, but he had nothing to do with vote fraud by the Ayatollah's in this so-called election. This is a digital revolution as well as a political one. It is the first time a dictatorship could be brought down by something called Twitter. In the old days dictators had it easy - just cut off the phone, TV and radio signals and the protesters were finished. The Internet can also be cut off and filtered (e.g. China)-- but for some reason the one thing the Iranian government cannot stop are tweets coming from Twitter. It's made all the difference. Iranian protesters are able to communicate and coordinate because of this technology that didn't exist a short time ago. It has enabled them to mass over one million people while the Iranian Ayatollah's had to bus in people to wave the flag for conservative Ahmadinejad and his religious allies that stole the votes of millions of Iranians. There is really nothing we Americans can do about Iran - meddling would only help the conservative Ahmadinejad (who was elected the first time after George W. Bush said not to vote for him). We can encourage the UN to be a vote recount monitor. We can also hope and even pray that the pressure of reform is too great for the hard-line Ayatollahs's that have kept Iran isolated from the world community as it sought nuclear weapons and supported terrorism. Reform has the potential to change Iran's direction. And new technology like Twitter is making change possible. Who knows what the next new technology will make possible. Just the way it was handled tells you something is wrong. When 85% of a country's population votes using paper ballots - and the result was announced a mere 2 hours after the polls closed, something is wrong. How the heck do you process millions of paper ballots in two hours? You don't. So it's obvious that the true story is that the conservative religious types running Iran have had a sham election that has a lot of Iranians hopping mad. And it's a shame. Change was in the air and the people were ready for it, just like in the U.S. in 2008. But nothing scares religious hardliners more than change. The U.S. should call for a UN-led election investigation of Iran's election. It should protest the arrests of the opposition leaders. The opposition in Iran needs that support --to fight for the Iranians who voted expecting a fair election not a rigged one. An international investigation would avoid another previously determined (rigged) answer. At the minimum it would shed more light on what really just happened in Iran instead of letting the extremists like Ahmadinejad claim they had a legitimate win. A Hurricane consultant spoke to my Seabrook Rotary Club about "Tropical Terrorist" Hurricanes, and it made everyone's hair stand on end. He was the hurricane guy for a major Fortune 500 company (now retired) that had to make calls on shutting down operations that would cost the company $20 million/day --but you had to do it at a certain point or have even greater damage to our nation's critical facilities for making the products like oil and gas be available everyday. That doesn't happen when plants are shut down due to Hurricanes. He said that IKE was not really a big CAT 2 storm and that serious thought was being given to re-classifying IKE as a CAT 1 storm -- based on wind readings onshore which were much lower. That means that people are thinking they survived a CAT 2 when it was weaker. Based on the actual damages from IKE that means if we get a REAL CAT 2 or higher we are in serious trouble. Our building codes are not designed for a CAT 3; they didn't fair well in IKE which was either a CAT 2 or a CAT 1. I heard one person say he overheard a well-known restaurateur, say: "We're safe for another 15 years" before another big storm. If he said that, he is making a serious mistake and needs to listen to Lew Fincher, who cited some eye-popping numbers of major hurricanes storms that have hit Texas in our history. The map is dense with repeated hits along our entire coast. People have to realize that denial doesn't work. Denial means more property damage and worse. Denial is dumb. The only logical and smart action is preparation. That means building buildings higher and better. Denial doesn't repeal the Law of Geography: we are as close to the coast this year as we were last year - maybe closer! Denial doesn't repeal the Law of Nature: Hurricanes are an ANNUAL event. They threaten us six months of every year. Like a game of chance, with the odds are staked against the coastal inhabitants. A strike one year does not rule out a strike the next. We are a potential target EVERY year. Thinking that we are out of the woods for another decade is playing Russian Roulette with a loaded pistol. That is like thinking that the next tornado is not going to happen when you live in tornado alley. That means the only sensible action is PREPARATION. That means we have to be able to Shelter in Place. I know of a family with a disabled son who can't leave the house and lives on the water in Nassau Bay. Right now they have no protection to keep a Hurricane from tossing debris into their windows, which would leads to loss of the roof and structural failure. Mr. Fincher also mentioned this in his talk -- how one small hole in a window can lead to structural failure. One oil company engineer who had our Armor Glass film installed told me that he calculated one hole in a window could create over 50,000 lbs. of uplift on the roof! We are back to HOT, HUMID Houston. I noticed it even though we were INSIDE doing a Hurricane show at Galleria on Saturday. They had us under their glass roof. Wow it was HOT standing under it when the sun came through. It was like being in a microwave, being roasted. I used to think of Galleria as a cold place. They could use our solar heat-rejecting, security film - it would save them a ton of money on air conditioning. Lately we've had inquires from Israel, Colombia and other countries. In England a couple weeks ago, I noticed a lot of half million dollar condos on the Thames River that had their windows OPEN - they have so much glass and so little air conditioning that the sun must be baking them. Another interesting thing I discovered was in Kensington Palace. Apparently the English have known for centuries that light destroys clothes - they used to have people making clothes in dark rooms to avoid its damaging effects. So while I listened to the lecture I went over to a window and checked - sure enough, they have a layer of solar film on the glass (since it stops UV rays that cause fading). It will be another wildly busy day today - meetings until 9 pm. A couple of days ago we had another FREAK STORM hit us in east Harris County. It shredded the bamboo sunshades that were hanging on the balcony. This is the second freak storm in the past month. Each has threatened throwing furniture into the glass off the balcony. Thank GOD for the security window film on the glass - I was traveling when the storms hit and can only imagine the mess from broken glass and rain intrusion.